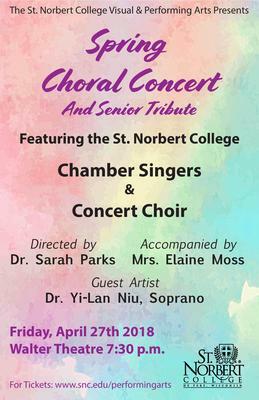 This is the annual spring choral concert featuring St. Norbert's Concert Choir and Chamber Singers, accompanied by Mrs. Elaine Moss, directed by Dr. Sarah Parks and featuring Dr. Yi-Lan Niu, Soprano. This concert was performed in the Walter Theatre, located at the Abbot Pennings Hall of Fine Arts. St. Norbert College Music Department, "Spring Choral Concert" (2018). Music Performances. 49.